Our Open Top Bins and Stackable Bins are made from strong 200#/ECT-B oyster white corrugated or 200#/ECT-32 kraft corrugated. Ideal for organizing work areas. 1|2|3|4|5|62%22|3%22|4%22|6%22|7%22|8%22|9%22|10%22|12%22|16%22|20%224+1%2F2%22|4%22|8%22|10%22|12%229%22|12%22|15%22|18%22|24%22 Select a Category123456 Width2"3"4"6"7"8"9"10"12"16"20" Side Gusset4 1/2"4"8"10"12" Length9"12"15"18"24"
Our Open Top Bin Boxes are easy to assemble and made from strong 200#-B oyster white (on one side) corrugated material with a durable one piece construction. They require no tape, staples or glue to assemble. They are ideal for organizing work areas or arranging materials and objects and can maximize your warehouse shelf space while organizing your inventory. 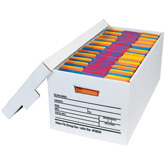 Every box has a write-on space located on the front panel for easy content identification. Measurements are in inches. Each Bin Boxes is 4 1/2" in height. 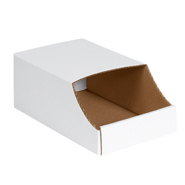 Our White Jumbo Open Top Bin Corrugated Boxes are easy to assemble and made from strong 200#-B oyster white (on one side) corrugated material wi th a durable one piece construction. 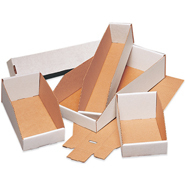 They require no tape, staples or glue to assemble because of their unique locking tabs. Because of the higher sides they are perfect for storin g large bulky parts and objects for organizing work areas or arranging materials and objects and can maximize your warehouse shelf space while organizing your inventory. Every box has a write-on space located on the front panel for easy content identification. 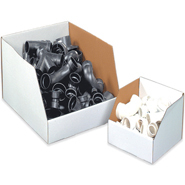 Made from strong 200#-B.ECT-32 white corrugated material. Having a covered top it allows these bins to stack one on top of another. Plus you also get the benefit of them being that much more sturdy. 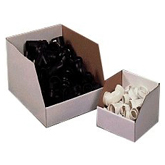 Get organized while using less space with our line of Stackable Bin Boxes that are easy to assemble and require no tape, staples or glue. Simply fold and lock the tabs in place. They come in different sizes to accommodate 12" and 18" shelves. 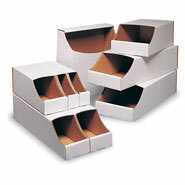 The streamlined shape of these boxes allow for organization in tight fitting spaces and can help clean up and organize work areas. These boxes allow for easily identified contents because of the front panel that can be marked. A "must have" for a n eat and clean work station.